Short grain rice cooked in chicken broth with ginger, chicken, and broccolini until thick and creamy. 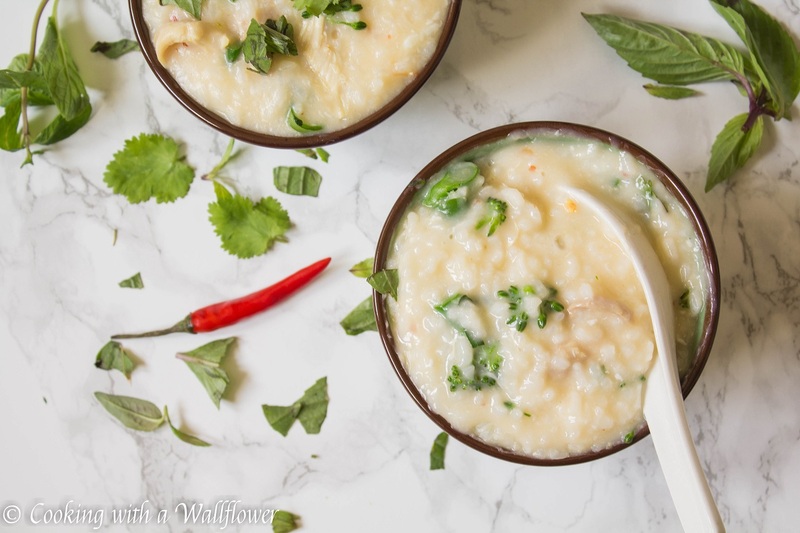 This chicken broccolini congee is a modern twist to a traditional Asian comfort food. What plans do you have to celebrate? Brunch? Lunch? Dinner? Flowers? Chocolates? Edible arrangements? I would love to hear your plans! 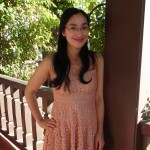 This year, Mother’s Day is, and I’m sure other holidays will also be later on, difficult for our family. Every year, on Mother’s Day, my family visits our grandma and we all go out for a family dinner. But this year, after losing our grandma just a few months ago, it’s been hard to find a new normalcy, especially since all the holidays and major events revolved around her. 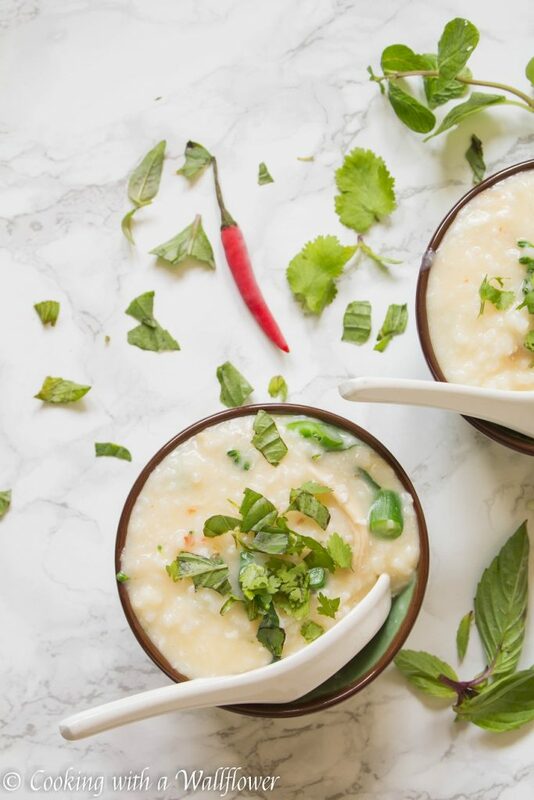 Have you ever had congee? It’s basically rice cooked in either water or broth until it’s relatively thick and pudding like. Sometimes it cooked plain and eaten with other side dishes. Other times, it’s cooked with meat and vegetables and seasoned with fish sauce or salt. It’s a warm and comforting dish, perfect for those days when you’re feeling a little under the weather. But it’s also great for breakfast. And it’s one of those dishes that my grandma ate often. 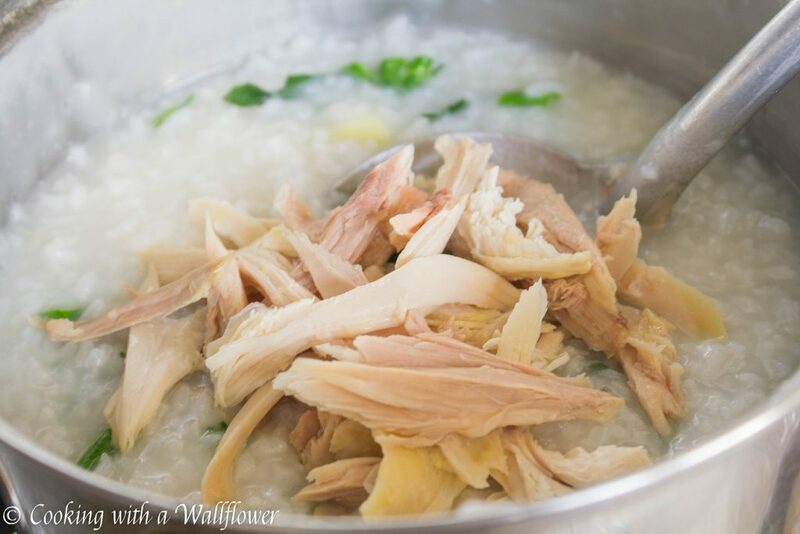 In my version of congee, I wanted something simple and used ingredients I already had in the fridge. In this case, chicken and broccolini. You can use other ingredients that you have on hand if you like. 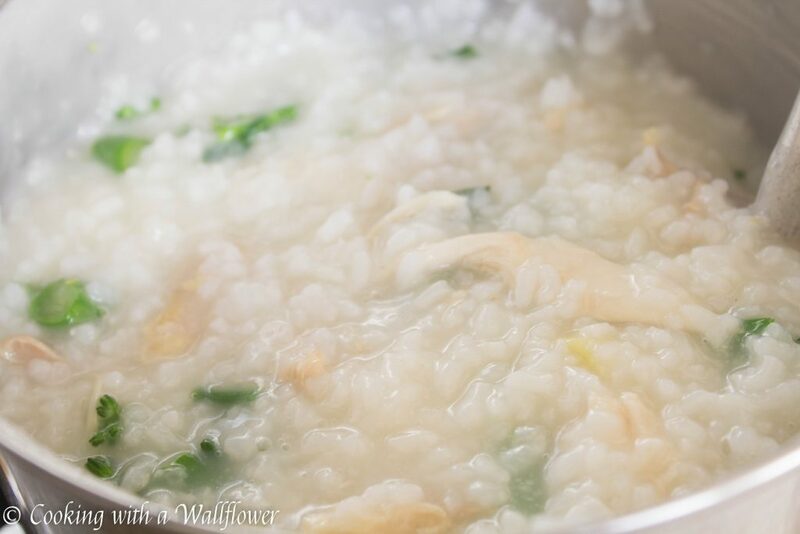 When making congee, my family prefers to use shorter grain rice, like Calrose. Basically, you’re looking for rice grains that are used to make sushi rice. 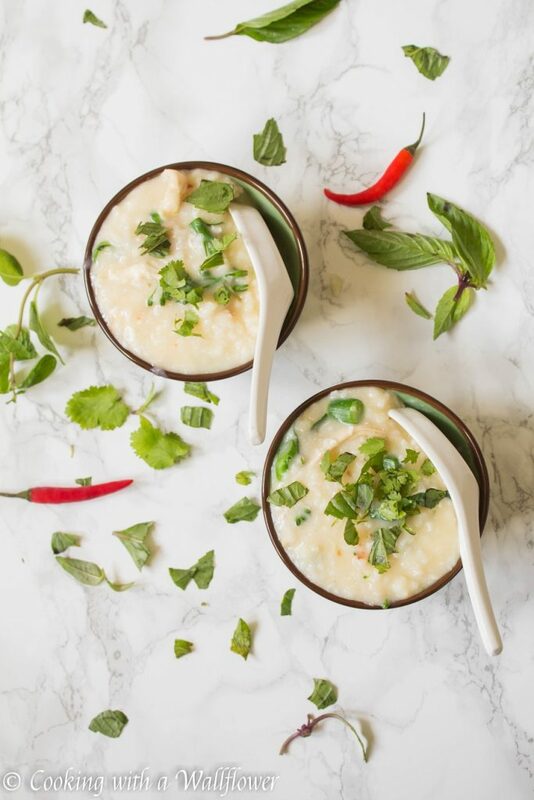 If you use shorter grains, it’s starchier and creates a smoother congee. 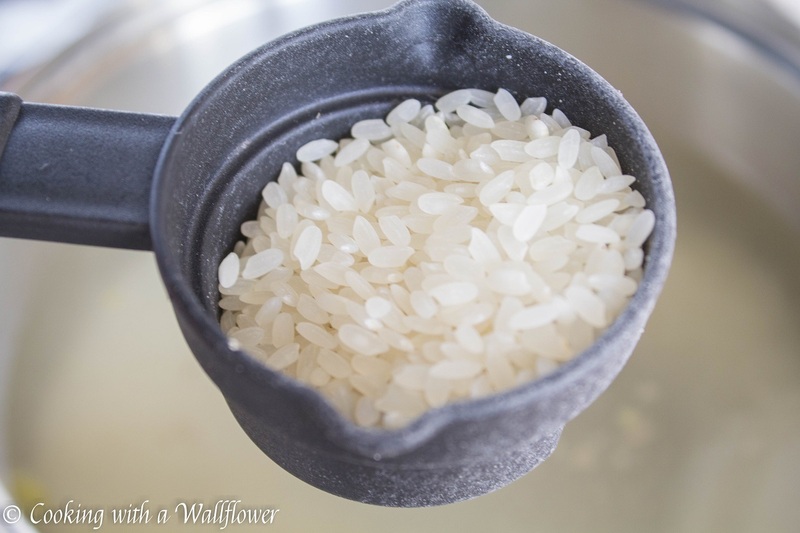 But if you don’t have short grain rice like Calrose, you can use jasmine rice too. 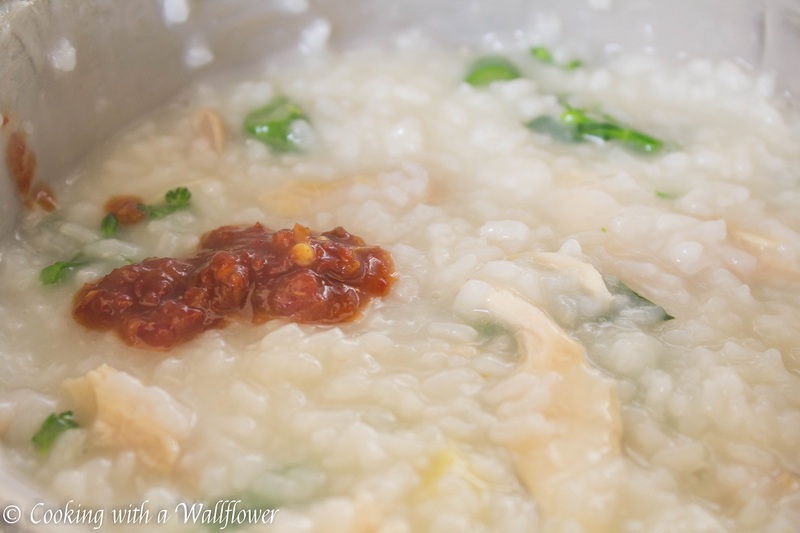 Kind of like oatmeal, you can have the congee very thick or more liquidy. It’s really up to you how you make it. It depends on what sort of texture you like. I prefer mine a little more on the liquidy side. 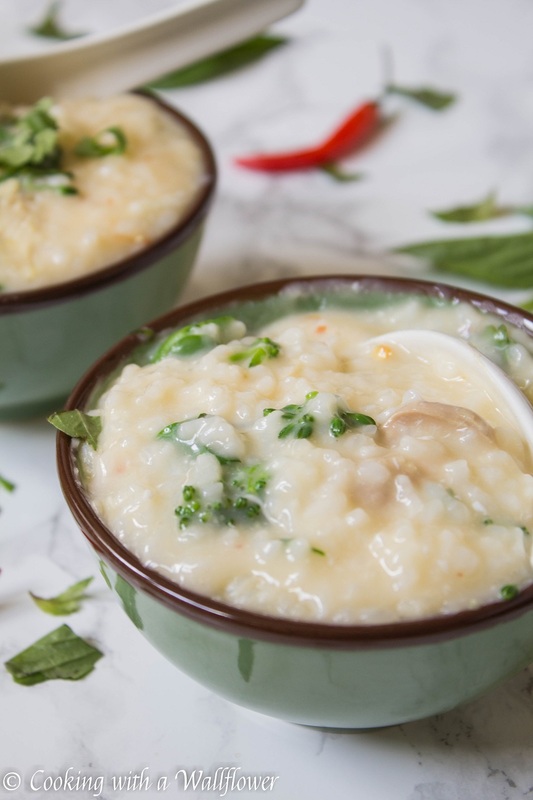 The longer you cook the congee, the more the rice grains dissolves. So depending on how you like the consistency of your congee, you can cook the congee for a shorter amount of time or a longer amount of time. If you like ginger, you can shred the ginger so that it dissolves into the congee. If you don’t like ginger as much, you can leave them in bigger pieces so you can easily take them out later. 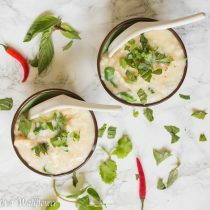 Ready to make this Asian comfort food? First, rinse the rice through a strainer. The water running off will look milky and after a couple of washes appear more clear. 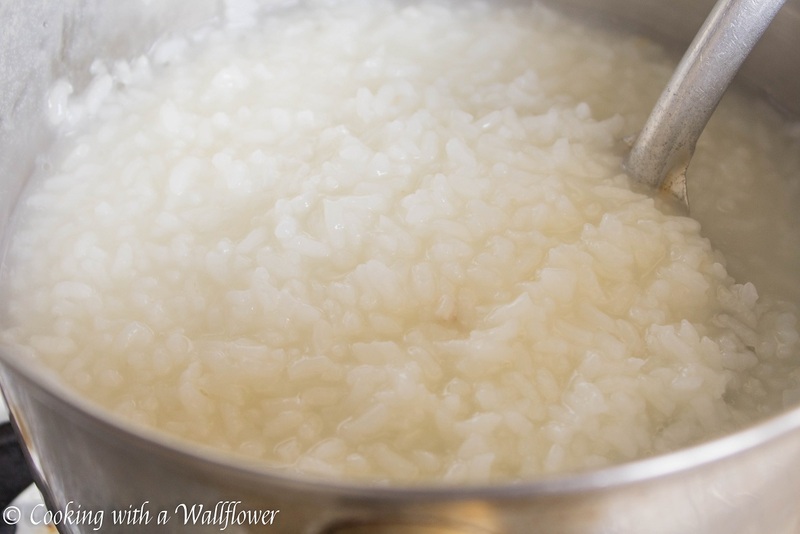 Place the rice in a medium sized pot, and add chicken broth and water. Bring to a boil and then reduce the heat to medium. Allow the congee to cook for about 15 minutes before adding the fish sauce, salt, ginger, and sugar. 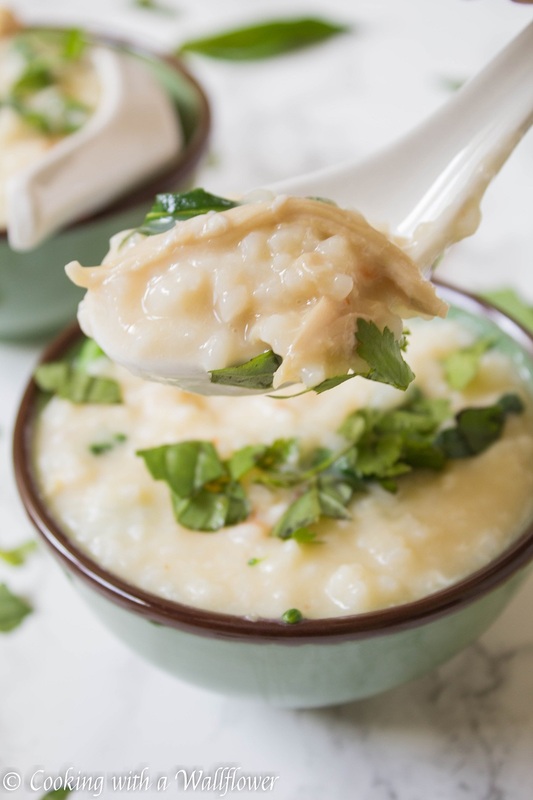 Cook for an additional 10 to 15minutes until the congee has thickened and appear pudding like. Now, stir in the shredded chicken, broccolini, and raw egg. Stir to evenly incorporate all the ingredients. Cook for an additional 10 minutes until the egg appears like silky threads and the broccolini is tender. Stir in chili paste if desired. 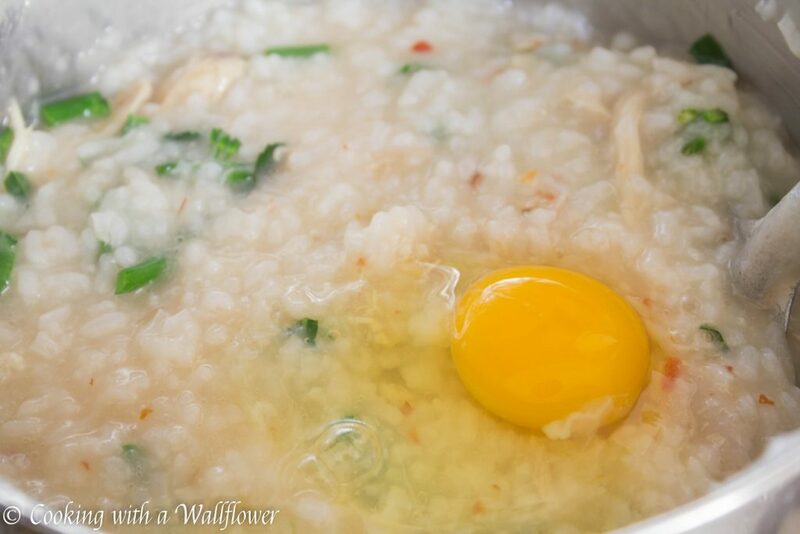 Remove the congee from heat, and let it cool for a few minutes. Serve the chicken broccolini congree with garnishes like cilantro, basil, or Sambal oelek chili paste. Short grain rice cooked in broth with ginger, chicken, and broccolini until thick and creamy. 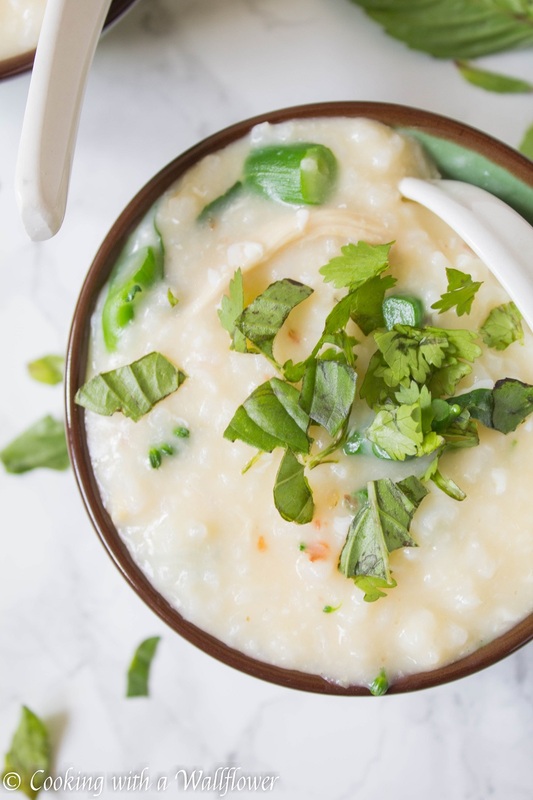 This chicken broccolini congee is a modern twist to a traditional Asian comfort food. 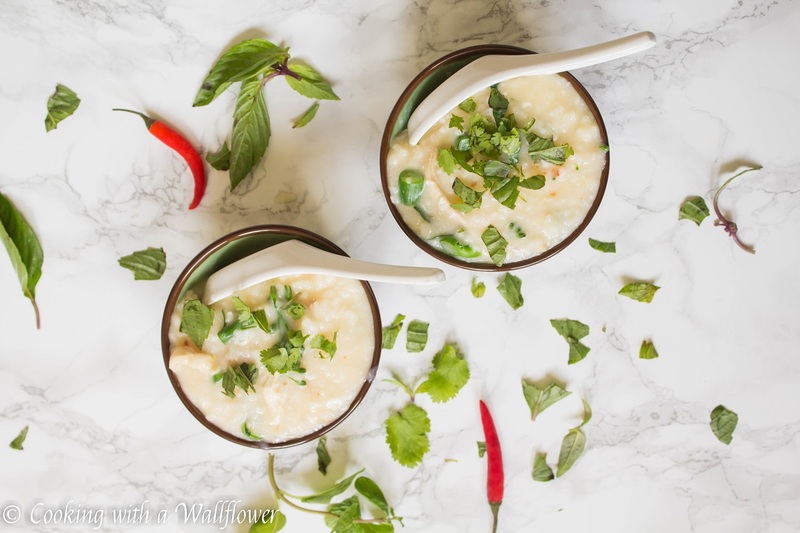 This entry was posted in Asian Inspired, Breakfast, Comfort Food, Gluten Free, Quick and Easy, Recipes and tagged Asian Inspired, breakfast, comfort food, gluten free, quick and easy. Andrea, this is true comfort food. 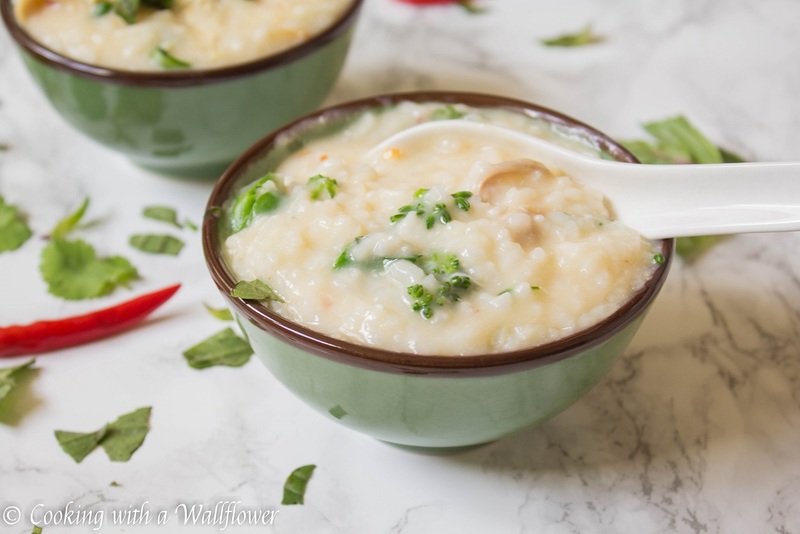 How interesting that we Indians make something similar to this and we call it congee too. We don’t mix anything in it. Rather we eat it with a pickle or some kind of side dish. We usually have it for dinner and the leftover for breakfast! Thanks for sharing it here at FF! We do it with pickles and side dishes too if it’s made plain. But sometimes, we do a savory version and we add meats and veggies to it. Such a comforting dish to bring at Fiesta Friday party. Thank you, Andrea. Happy FF and have a lovely weekend! Looks good! I made it once with chicken and a variation of vegetables, so good. I love broccolini, and this looks and sounds delicious. This looks so delicious!!! I got hooked on congee on some trip and usually get my fix at Samovar, funnily enough. I gotta try making it! I actually haven’t been to Samovar. I’ll have to go. You gotta go! Visit the one at Yerba Buena. I love their Duck Jook and the Ginger-Quinoa waffle, and their chai is incredible. I really love this idea. It reminds me of grits — as in Shrimp and Grits. Will definitely have to give it a go! That sounds too wonderful- I’ll have to try it soon!